Like a warm welcome for a female visitor at the steps of the R&A clubhouse or a photograph of Colin Montgomerie smiling after a bogey, a captivating book about golf is hard to come by. The problem is not the sport, which at its core is a beautiful and simple ball-and-stick game, but the people who play it. At the amateur level, the game is mostly populated by 19th-hole bores, thrusting business types who can't step on to a fairway without punching up their stockbroker on the speed dial and, a recent phenomenon, the so-called "urban golfer", who is under the misapprehension that golf is cool because it features on the fashion pages of GQ magazine. It is also fair to say that no profession, with the possible exceptions of politicians and funeral directors, takes itself so seriously. Po-faced bores in cashmere sweaters are not the stuff of captivating, or even mildly interesting, literature. There are exceptions to this rule, of course. John Updike has written many terrific essays about golf, as has Sports Illustrated's star columnist, Rick Reilly. The British journalist Tom Cox's Nice Jumper is a hilarious first-person account of his teenage years spent subverting the behavioural codes of his hometown golf club, while the frequently collected work of the Guardian's former golf correspondent Peter Dobereiner never loses its sparkle. Then there are the golf stories of PG Wodehouse, which rank among the great humorist's finest. But while Wodehouse and Dobereiner never forget that golf is just a game and the people who play it are sometimes absurd, there is an army of earnest authors for whom the sport is a metaphor for life itself. The upshot is a steady stream of books in which the golf-playing protagonist is either searching for the soul of golf (and the meaning of life, naturally) in a far-flung corner of Scotland, or bonding with a dishevelled but socratic caddy over a whisky in the clubhouse after a life-affirming day on the links. 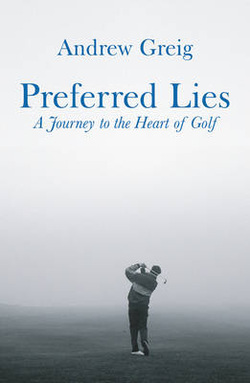 On the face of it, Andrew Greig, author of Preferred Lies, belongs to golf's metaphysical tendency. Convalescing on the Orkney Isles after brain surgery, the award-winning novelist and poet climbs into the loft to find clubs he used as a boy, dusts them down and heads towards the local golf course at Stromness. "I admit my heart was beating fast as I pushed open the little brown gate and stepped on to the course," he writes in the first chapter, before setting off on a journey around the golf courses of Scotland. And I admit my heart was sinking fast at this point. Fortunately, it didn't take Greig long to rid me of my finely honed prejudices against the genre; a single paragraph, in fact. "Golf isn't life," he explains. " It is just a small, radiant corner of it, like a chip of mirror-glass, the kind where if you bring it close enough and examine it carefully from a number of angles, you can see the whole of your eye, and a surprising amount of the world around you." While it is true that many have said such a thing before, no one has said it so well. The book is sprinkled with similarly gorgeous prose, such as Greig's description of the view from the 10th tee at Shiskine golf club on the island of Arran. "I stood on the tee at the top of the course, with a 360-degree panorama across the Arran, the Sound and Kintyre peninsula, where the three-quarter moon had silently risen like a blood grapefruit. The breeze had dropped to a whisper; sea and birds were hushed in the gloaming, that luminous summer dusk of the north." Then there is his account of an agonising day spent playing resort golf in Bermuda: "Choking on that beautiful golf course, as everyone moved around the perfect greens as though wading through sun-drenched treacle, I ached to be out of there." Yet Greig's purely struck prose is not the only strength of his book. For one thing, he has excellent taste in golf courses. Not for him the usual litany of famous Scottish venues, although he visits and pays homage to such courses as Royal Dornoch. He also alights at lesser known, artisan golf courses such as Bathgate and Dollar. Neither will ever host an Open championship but their appearance here serves as a welcome reminder that the game hasn't been completely overrun by the blazer-and-tie brigade. Greig also has a nicely understated sense of humour. His account of a week spent in the company of a group of Buddhist golfers performs the neat trick of being both funny and affectionate.